Art is a big part of my life. At least, it used to be. Since I started my teaching career 4 years ago, the closest I've got to art is ordering backing paper in my role as art co-ordinator. The glamour! Now that I'm cutting down my hours at work, I'm hoping to devote more time to art, especially as I can now drive to hard-to-reach galleries and sculpture parks. This also means I'll be able to write more about my passion, developing a weekly art series. So, to kickstart this series, I'll be writing about my favourite artists and explaining why I love them. I think most of you will have picked up that I love Grayson Perry, given my little bio on the left there. I still remember when I first became aware of him; I was reading my dad's Daily Mail (I know, I'm ashamed too) around the time of the 2003 Turner Prize. I forget whether it was a rundown of the nominees before the ceremony or if it was a feature on Perry's win after, but the article discussed his pots and the twisted stories they told. As a thoughtful, philosophical 15-year-old, I was drawn to the paradox of his childlike images against dark narratives and was hugely influenced by this for my GCSE art exam. As I grew older, I came to appreciate how his background, which is remarkably similar to my own, has played a part in his life and art. 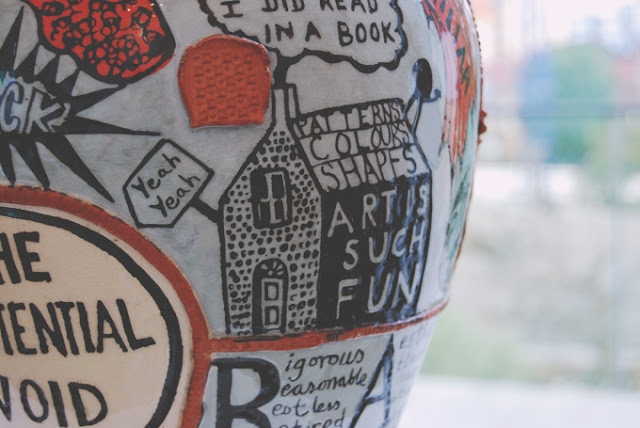 His commentaries on class, identity and family relate to me on so many levels, and his relationship with teddy Alan Measles is just like that of mine with Fluffy. Then, of course, there's his aesthetic which is right up my street! Yep, you may have noticed there's a pattern to my favourite artists. Postmodern sculpture is my thang, especially if they've been nominated for the Turner Prize and fall into the "I could do that" category. 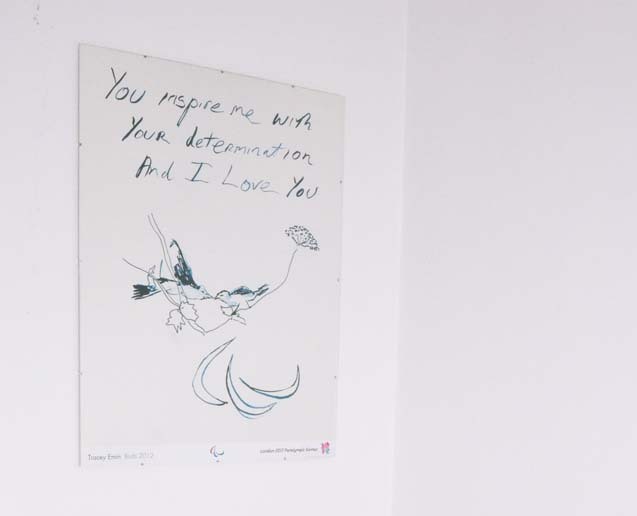 Again, I first became aware of Emin as a teen when she was at the height of her media attention and again, I was drawn to the narrative behind her art. When I began studying art at A level, I looked into her work in more depth and was inspired by how open she was in her art, how she used it as a means to lay her life bare. I have very strong memories of being brought to tears in Tate Modern (or was it Tate Britain?) as I read Exploration of the Soul. Her honesty, openness and frankness about her past continues to inspire me, something that long-term readers of this blog may be aware of. It's difficult for me to choose a top three because, although I have a huge amount of artists that I absolutely love, Perry and Emin are way out in front. Picking another to join them is like choosing a favourite chocolate bar- There's just too much choice and I can't decide on an order. Instead, I'll list the other artists I love below, in no particular order. Damien Hirst- To be honest, he'd probably be by third favourite. Anyone who deals with death is an instant favourite. Anthony Gormley- For a while, he was my favourite but I find his work doesn't speak to me (holy art cliché, Batman!) much. Marc Quinn- This is a lie, because I don't know much about his art, but Self is one of my favourite artworks of all time. In a nutshell, if it doesn't look like "art", I'm all over it! Do I love this?? YES I DO. awww, delightful career change for you ahead! I always love learning about new (to me) artists...so thanks for sharing! I heard of Perry from a young age but never really admired his work until last year when I saw his tapestries at Temple Newsam, I just loved the narrative behind them and how they had historical influences too. I do think that Tracey Emin gets a bad wrap, and she is so well known for a reason - but ohhh that picture that you've posted is one of my least favourites! It was done for the Paralympics and I find it really offensive - the idea that the Paralympians are doing it to inspire Tracey or be beautiful really angers me, it's quite an arrogant statement! However - love this post!! Bloggers should talk about art more (including me..!)! Oooooh this is interesting! Where do you stand on seeing paralympians as inspirational? The way I see it is that she's praising them, rather than saying "Yo, keep going. You're impressing me". It's FAR from my favourite of her works but it's the only one I had an image of as I haven't seen any of her works personally for 10 years.